Here I am struggling at the moment with Laravel mix and browsersync. This is not a awps matter but i thought it might be the right place since awps uses both. Sorry, i thought i could edit the post. So, as you see everything looks fine. Browsersync only works on localhost:3000 though. In order for browsersync to work with a proxy host, in your case lara3.dev you need to add the browser sync script like I did in AWPS. Check that script enqueue and see what's missing. Also, check this video where I explain how Gulp and BrowserSync work on an HTTPS connection. 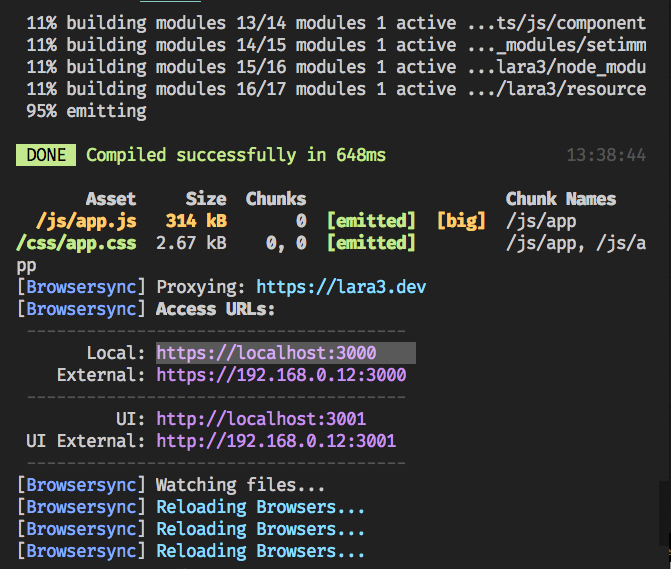 I know Laravel Mix uses webpack, but the concepts and steps to fix browser sync are the same. With HTTPS=true in the .env file. (since that line is only necessary with https connections, i hope it's ok, it works so far). marcosdipaolo That's perfect, I'm glad you solved it. hi Alex!, does this bug still happens? i mean we still do have to put manually the script tag if we want to proxy with laravel-mix?